Caldo de Res and Mole de Olla are not necessarily the same thing. But since dishes vary from region to region, sometimes they can overlap. 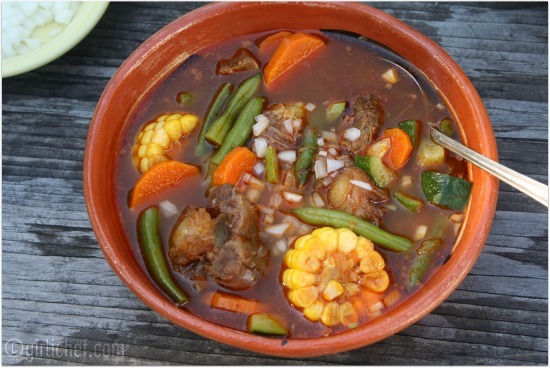 The recipe that I based this Caldo de Res on was actually labeled Mole de Olla. But mi esposo and local Mexican friends tell me NO! It's not Mole de Olla, it's Caldo de Res. Confused much? I asked hubby just what the difference is...and he says he doesn't really know. I tried researching it a bit, but when I find pictures or descriptions of one or the other, they somewhat overlap. 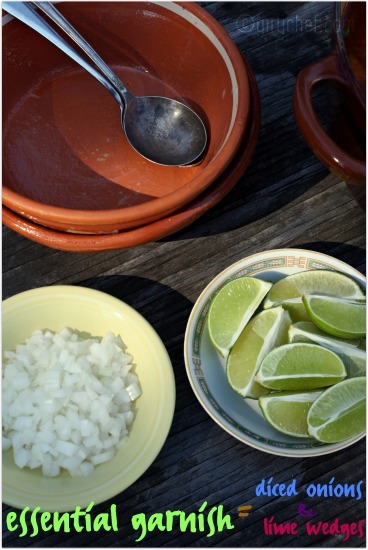 Perhaps some regions leave the chiles out of their Caldo de Res? * Perhaps some leave it out of their Olla de Mole? After a few hours of hair pulling and trying to figure out here from there, I just gave in and decided it could be either-or. I really do think it boils down to who is making it. Methods seems to vary from region to region, city to city, family to family, and cook to cook. When I talked about the different types of moles the other day, I mentioned that although not a sauce, Mole de Olla still qualifies as a mole in the broader sense of its original meaning of stew or sauce. Looking at the meaning of the terms...Olla is actually the name of the pot that something is (traditionally) cooked in ...a tall, narrow earthenware pot. So, originally...a soupy mole that simmered in an olla. A caldo is basically a soup or broth. So...a meaty broth in this case, if you will. Yeah. I'm still not any closer to deciphering the two. I'd love to hear your thoughts on either. If you've tried them. If you make them. What is your version, or the version you know you like? And if you know the region of Mexico your version came from, I'd love to know that as well. No matter the name, this is a rich, brothy soup laden with meat, chile, and veggies that is sure to satisfy. *Update: ...and yes, I'm told that Caldos usually are just the broth, without chile. When you add chiles, it turns into the Mole. Although, I'm guessing it has evolved over generations, like in my hubby's (and many others) family. He grew up with chiles in his Caldo de Res. But I do believe to be technically correct, without chile equals caldo and with equals mole. Today is the 3 year anniversary of Souper Sundays which is hosted weekly by my friend Deb of Kahakai Kitchen. Be sure to head over there this evening and check out all of the wonderful soups (plus salads and sandwiches) she's rounding up for this celebration! It's days like today that I wish we were neighbors. :) I would so love a big bowl of Mole de Olla right now!!! The weather this morning is super chilly and this would definitely help me warm up. This looks awesome! This reminds me so much of big dishes served in a restaurant when I lived in South Texas! I'm just going to call it Mexican beef stew! It looks delicious by any name. That's a perfectly warm, delicious and healthy soup for this time of year. This is such a beautiful soup with all the colors. I never thought to slice the corn that way, I bet the cob adds lots of extra corn flavor. Hola!! seguro tu esposo sabe muy bien ;D .
Un plato realmente contundente y sabroso. No matter what it is called it looks perfect for a day like today Heather. I really know squat about mole. But I do know I would die for a bowl of this right now; it looks hands down amazing! 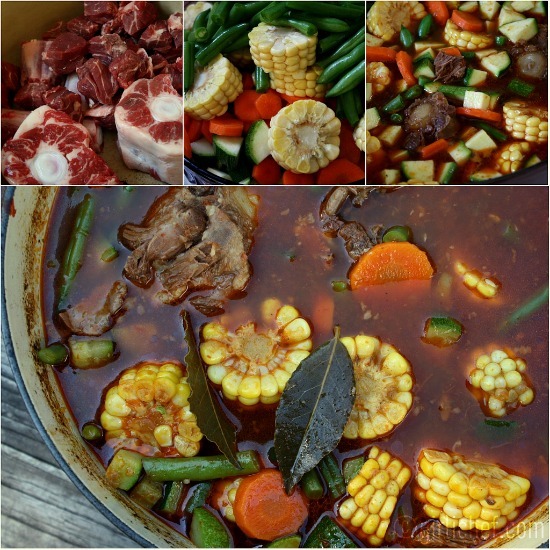 I have been drooling over this Caldo de Res since you posted it. I can't wait to make this dish it looks heavenly! Thanks for sharing and hope you are having a great day! Mole or olla, this is one big pot of colorful love. Thanks for sharing it with See Ya In the Gumbo. Yo quiero! Your pictures always come out so vivid and beautiful, the colors of that dish look amazing. I'll have to ask some friends if they know the difference between the two. One is from Mexico City and one is from a very small town a couple hours outside of Mexico City, I forget the name. I'm curious to hear what they say. I'm going with stew on this one too, Heather. And my oh my doesn't it look wholesomely delicious! GREAT for chilly autumn evening no matter where it came from. 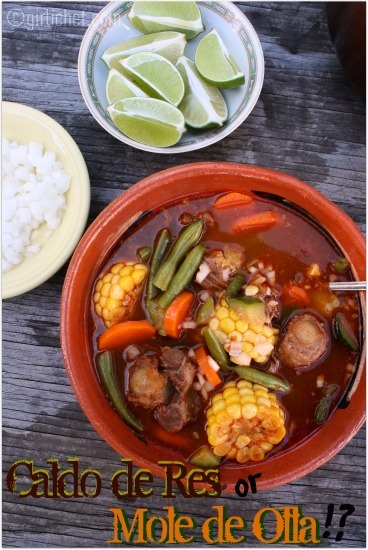 I have always known this as caldo de res, but as you stated recipes change with regions. 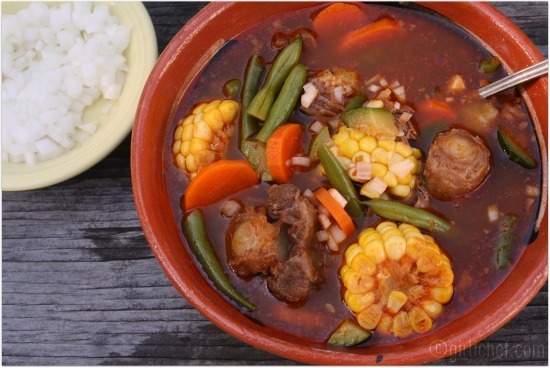 I lve caldo ro mole so I'm good, I'll take two bowls..
Any way you name it, it definitely looks deliciously comforting and warming. On a morning like this - I could just jump right in the bowl. I have been crazy busy and am so far behind on my blog reading so I'm just now catching up on your recent posts and this one especially looks wonderful, with our current cold weather I would love a bowl! holy mole is it a mole or not, lol. I'm glad you found out the difference because I was totally confused on the first paragraph.